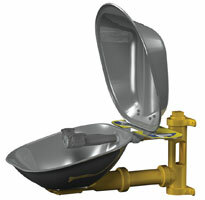 The Helios is a self-contained eyewash station that requires only 9.4 gallons of flushing fluid to deliver a continuous flow of more than 0.4 gallons per minute for a full 15 minutes. The recessed eyewash head insets on the vessel protect the nozzles and help prevent contamination buildup. To use, simply pull the tray down, and the fluid begins to flow to the nozzles immediately. This shower unit is molded of chemical-resistant fiberglass and comes equipped with a pull-rod-activated shower and push-handle eye/face wash for quick rinsing. The shower booth has a lipped front edge to contain water and a drain to connect to plumbing. Emergency showers are fully assembled and ready for installation to water supply and waste systems. The Axion MSR eyewash system has streams that are inverted so they contact the eyes at the inner corner, adjacent to the bridge of the nose. Contaminants are swept to the outer edge of the eye, where gravity takes over, running them into the eyewash bowl. 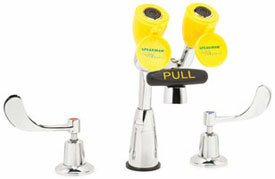 This technology is available on both eyewash and shower models, including wall-mounted, pedestal and combination units. The Fendall 2000 Heated Accessory eyewash station is ideal for workplaces that are extremely cold or vary due to seasonal weather changes. It is made of sturdy, long-lasting vinyl and can be used in temperatures as low as -40° F while still maintaining the cartridge solution at a tepid temperature as required by the ANSI Z358.1-2009 standard. The HALO eye/face wash covers 85 percent of the user’s face, which is more than 20 percent better protection than any other eye/face wash on the market, according to the manufacturer. It incorporates a self-draining feature, which eliminates standing water left in the unit between uses and testing. 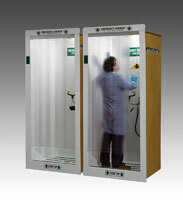 New and enhanced dust covers provide added protection and keep units clean and ready for emergency situations. The SEF-1800-CA Eyesaver Faucet is a combination eyewash and gooseneck faucet on which each component operates independently. In addition to no-lead certification, the Eyesaver Faucet line has been certified to meet ASME A112.18.1/CSA B125.1, including NSF 61, Sec. 9.